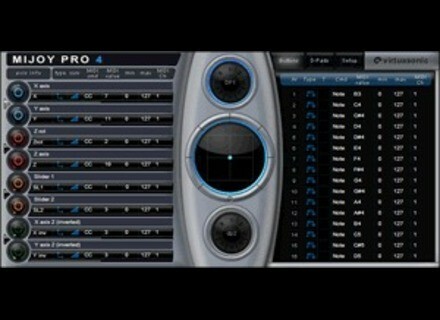 MIJOY PRO 4, MIDI Plug-in from Virtuasonic. Virtuasonic has released version 4.0 of MIJOY PRO, its VST instrument plug-in for Windows designed to allow you to use a joystick or gamepad as a MIDI controller. 8 slots assignable to every joystick axis of your choice between X, Y, Z, Slider1, Slider 2, Z-rotation and their inversions. Now the same axis can be assigned to more than one MIDI command at the same with independent MIDI settings (Ch, minimum/maximum value, axis response, etc.). New axis display with four switchable pointers, one for each couple of axes. New navigation menu with buttons. The MSRP price for MIJOY PRO 4 is $34.95. macProVideo N.E.D.i 2 Software tutorial-video vendor macProVideo.com today announced the release of Version 2 of their iPhone & iPod Touch software tutorial-video player, N.E.D.i (NonLinear Educating Device for iPhone). discoDSP Vertigo Mac Version Update discoDSP has updated the Mac version of Vertigo, its 256-oscillator additive synth with resynthesis and sound morphing, to v2.1. de la Mancha GTX de la Mancha has announced the release of a new bundle of two vintage-style 'character' compressor VST effect plug-ins for Windows: GTO and GTX.